A well placed shot of the right caliber should never fail to bring down a target. With Nosler Ballistic Tip ammo, you needn't worry! 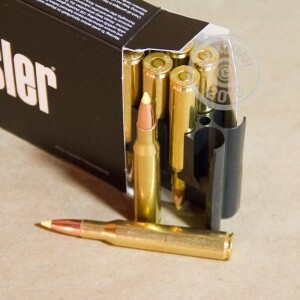 These .270 Winchester cartridges are effective on all small and midsize game. 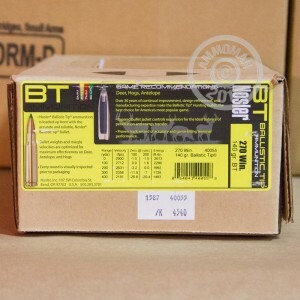 Each round in this box of 20 propels a 140 grain Ballistic Tip bullet to a muzzle velocity of 2,900 feet per second. The Ballistic Tip bullet is a polymer-tipped design with a boat tail that produces superb aerodynamic performance. Upon contact with a target, the tip initiates expansion while the tapered jacket yields to the round's heavy base to produce a wide mushroom. An excellent way to bring a deer down in its tracks! Nosler of Bend, Oregon produces this ammo using its own bullets and other components. Needless to say, these cartridges use non-corrosive Boxer primers and brass cases.